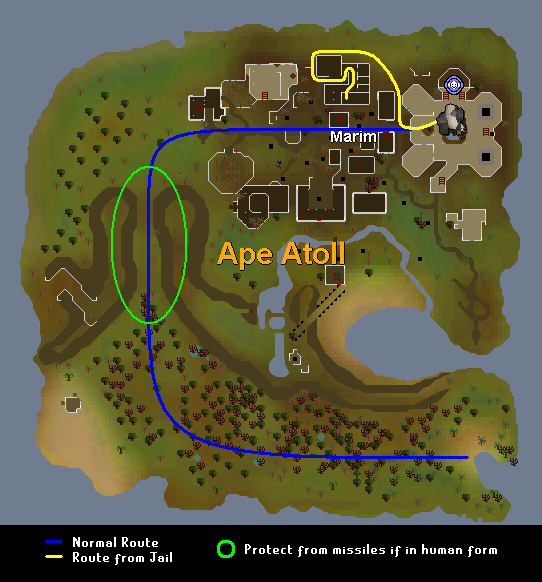 The Monkey Madness quest will unlock the island of Ape Atoll along with the city of Marim. Within this city is a temple populated with gorillas guarding it, and training on these guards can earn you great experience in combat.However, there are risks involved since these creatures are high-leveled, and aggressive. This guide will explain how to train on them effectively using several different methods. This method of training can help you gain great amounts of experience, but it comes with a risk. You must constantly pay attention: this is not the type of training where you can do other things while here. Sal's Realm of RuneScape will take no responsibility if you should die by any means while training here. Remember these are all recommendations and not strict requirements. If you have a different way of training here then it is fine. This guide is only meant to give general strategies on training here. Pros: Prayer altar right next to them. Cons: Multi Combat zone, and must pay attention to prayer all time, High Defence. These gorillas come in two forms, one form has a beard and you can not walk through it. The other form has no beard and you can walk through it. These gorillas offer great training for high levels and are a great place for D'harokers to train. Here there are different ways to train effectively in order to maximize your experience per hour. For high levels it can exceed 40,000+ experience per hour. This guide will help those who wish to train, learn how to make the most out of their time, and to help prevent death while training here. Anti Poison Potions or a prayer book received from The Great Brain Robbery are a must, since most of the creatures on the island are poisonous and there is a poisonous spider inside the temple. To prevent dying of poison then it is necessary to bring either anti poison potions (Super Anti-p potions will prevent poison for a short period of time), or a prayer book to heal yourself of poison if you are wearing a holy symbol. Food: Sometimes you will take some damage either getting to the temple or fighting the monkey guards, a few pieces of food could mean the difference between life and death here. Monkey GreeGree: You receive this during the Monkey Madness quest and this will help greatly in getting to the temple, or when you need to take a break from the constant attacks by the gorillas. It is recommended you have a second GreeGree in order to make getting back to your grave site easier in case you die here. Super Anti Poison Potions: Although anti poison potions will work fine, super anti poison potions will make training here easier and will save inventory space, as well as protect you from getting poisoned for 5-6 minutes. One Click Teleport: Here you can never tell when training goes sour. It is highly recommended to bring some form of quick teleport. This can include teleport tablets to various cities, an ectophial received from the Ghosts Ahoy quest, a teleport crystal received from the Mourning's End Part 1 quest, and a grand tree seed pod received form the Gnome Restaurant mini game, among, others. 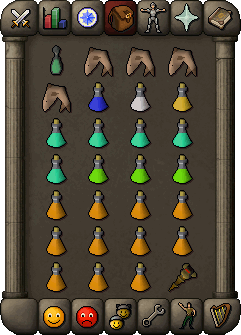 Potions: Other than the anti poison potions you should bring potions (Attack, Strength, or Range), to boost whatever skill you may be training in order to train more effectively. 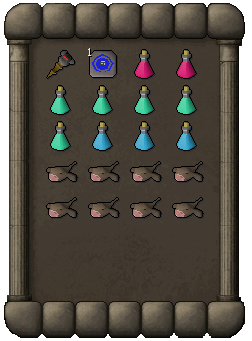 Prayer potions should be brought no matter what method you use, just in case you get stuck and cannot get to the altar. This is the longest and most painstaking method to reach the temple. First you must reach the grand tree by any method you choose. Once you reach it go to the second floor and talk to Dearo to enter the gnome glider hanger. Once inside speak to Waydar to fly to crash island. Once you reach crash island speak to Lumdo to sail to Ape Atoll. When you arrive transform into a monkey if you have a GreeGree, and begin walking North-West. If you are in human form turn on the Protect From Missiles Prayer as you approach the gate to prevent damage from the monkey archer's arrows. If you are in monkey form then just walk through the gate and continue your way. If you were in human form and was captured then escape from the jail, go around it, and then enter the temple. 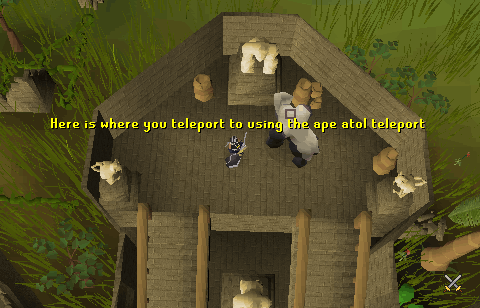 Gather the items needed to use the teleport to Ape Atoll teleport (2 law runes, 2 fire runes, 2 water runes, and a banana) and teleport to ape atoll. You will arrive in a room with an altar that is just above the temple (picture of the room). This method requires the Saving King Awowogei portion of Recipe for Disaster completed but it is well worth it for the time and trouble saved. This section will go over a few different ways of fighting these beasts close up and personal. This is one of the most popular ways to fight these gorillas and is very good if you want some of the best training while seeing yourself hit high. It is popular, because not only do you hit high, but you get a great strength bonus! Stat Enhancing Potions - Strength Potions, Attack Potions, etc. Explosive Potions to wear down health safely (optional). When you arrive at the temple go upstairs into the safe area if you plan on lowering your health using explosive potions. If not, lure one gorilla to attack you and wear down your health. You must be careful as their max hit is 140 Life Points of damage. When your health is low enough turn on the protect from melee prayer and any other stat boosting prayers you wish to use, and start attacking. Remember to drink your anti poison potions whenever the spider manages to poison you as it can poison through prayer. Drink your stat enhancing potions as you see fit. 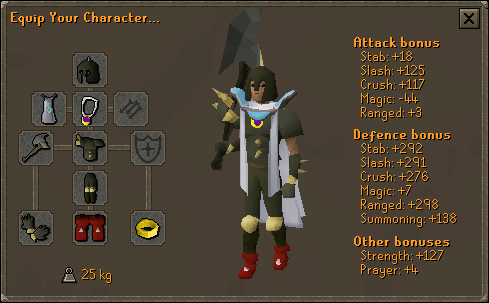 Dharok's set effect does not increase any more once your Life Points drop below 10%. This means that there is no reason to have less then 10% of your Life Points. The holy wrench slows prayer drain and is worth bringing if you have it. This method is simply going up and fighting the gorillas with the weapons and armor of your choice. 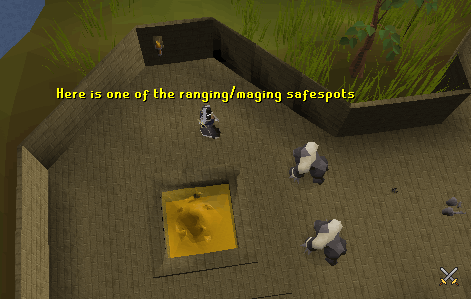 This is the most common way of fighting the gorillas. 70+ Attack - The higher your attack level is the easier it is to fight the gorillas. Having at least 70 will make training here more effective. 70+ Strength - The higher your strength level is the easier it is to fight the gorillas. Having at least 70 will make training here more effective. 60+ Defence - The higher your Defence level the less likely you are to die if you make a mistake. Drink any potions you have before entering the temple including a super anti poison if you have one. 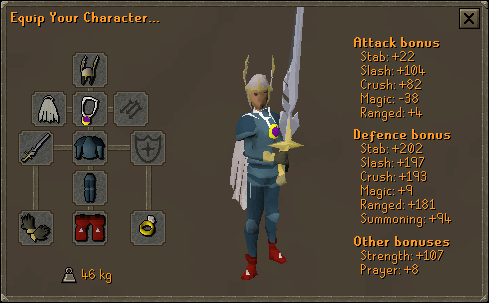 Turn on your protect from melee prayer along with any stat enhancing prayer you wish to use. 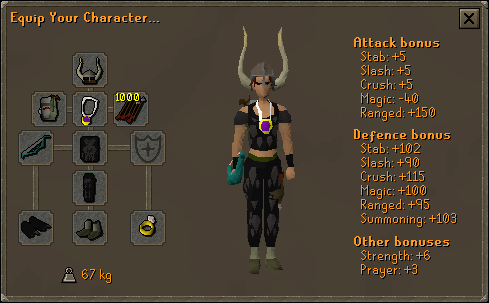 he protect item prayer is not a bad idea to use either if you aren't confident. Begin attacking the gorillas as you see fit while making sure to recharge your prayer at the altar when your prayer gets low, such as around 10 points. Be careful of the poison spider and remember to drink anti poison potions when necessary. Remember to eat if you start taking damage. 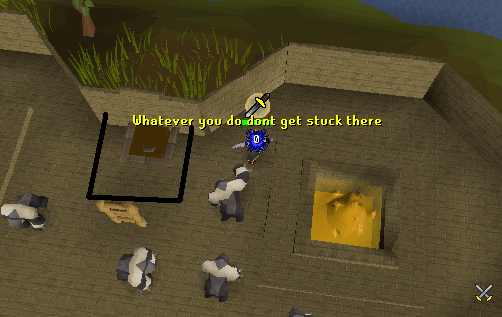 If you get stuck with no way our and are low on prayer and have no food, teleport out. It is not worth the risk if the gorillas trap you as it is not easy getting out. You can substitute some of the armor for the void melee set. With this set you will gain a 10% bonus to attack and strength. This can be a very useful bonus as it does not wear off as long as you wear the full melee set. Because you will be praying the whole time Defence bonuses do not matter much here. Use the same inventory as with regular melee. Keep your Life Points as high as possible. You are not Dharoking so it is a good idea to have a cushion of Life Points should you mess up. 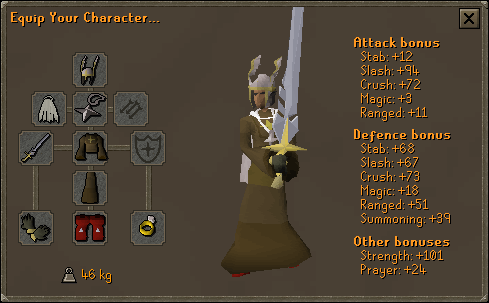 If you want armor and prayer bonuses use Proselyte or Initiate armor, these can be gotten from the Wanted/Slug Menace quests. Just use the regular melee inventory for this set up. This section will detail the methods rangers should use when training here. There are not many rangers that choose to train here as there are better options. However this can still be good xp if your range level is high enough. 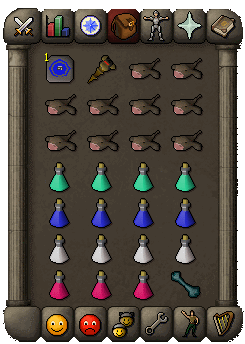 5+ Pieces of Food - You may take damage while collecting ammunition, poison, recharging prayer, or random events, monkfish or higher are best. In the temple there are safespots by the ceremonial pyres that you can use to your advantage. The method is simple; stand at the safespot and shoot the guards. They should not be able to hit you. To collect your arrows, wait until the guards have passed, so you can safely get them. If you want to collect your arrows without having to wait for the guards to pass, just use protect from melee and recharge at the altar as needed. While the guards are aggressive, consider using bronze arrows so you lose little money. When the guards stop being aggressive, switch to steel+ arrows and collect your ammunition when you sit fit. Knives have a much lower range bonus then bows and because of the gorillas high defence its best to stick with bows. Instead of picking up ammunition the whole time you could just use bronze arrows and leave them. Try to avoid going near the area between the ladder and the trapdoor, if you do there is a chance you may get stuck there. If you get stuck there you could either go up the ladder and wait for the gorillas to move or go over to the ladder in the South East corner of the temple and go down from there to get unstuck. Make all your potions 4 dose potions so they will last longer. 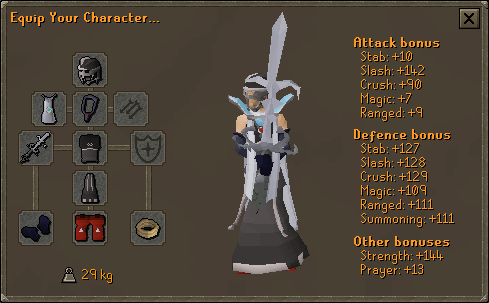 For beginners turn off all chat so you can concentrate on fighting while you get used to having to recharge prayer on a constant basis. 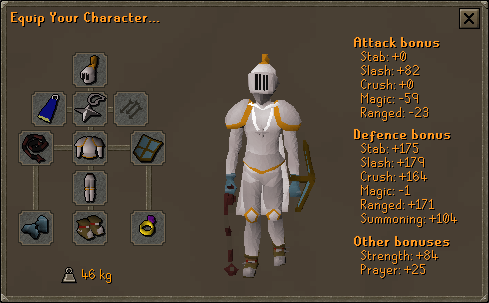 Beginners may want to bring prayer gear for their first time as it will slow prayer drain and if you should die you might not lose as much money in armor, weapons, etc. Remember to check what items you will keep on death, the main reason you may die here is if your prayer runs out in a tight spot. 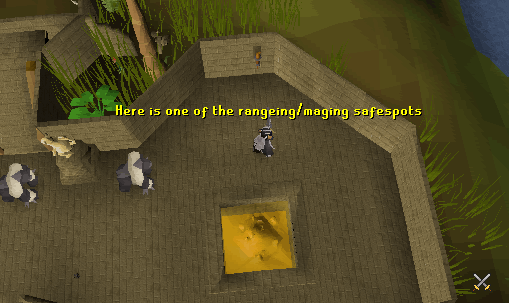 Don't count on your protect item prayer while training here. Prayer potions can be substituted for more stat boosting potions for those more experienced here. It is a good idea to have at least one for emergencies however. When you see someone die keep their grave alive. It is a nice thing to do and someone may do that for you. Some of the equipment sets people bring here are expensive or difficult to get. Having good karma is a very good thing.